Sölden Ski Resort | Sölden Ski Resort | Ecosign Mountain Resort Planners Ltd. The Sölden Ski Resort, located in the Ötz Valley of Tirol, Austria has four ski areas with combined annual skier visits of 1.4 million and is serviced by approximately 20,000 guest beds. 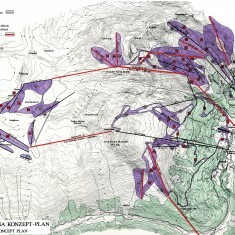 Ecosign completed a Master Plan study in 1993 to determine the ski area capacity, overnight accommodation, commercial location and capacity, together with a time and motion study of traffic during peak and normal utilization periods. The objective of the study was to measure and analyze the severe traffic congestion problems in the Village and to provide design solutions to reduce traffic and thereby improve the quality of life for local citizens and the tourist experience. Ecosign subsequently presented a unique and innovative solution for the current traffic congestion and pollution problems which clogged the Village of Sölden during the winter and summer seasons. The proposed solution included a new, two-stage gondola from the centre of the village, a two km bypass road with a 650-meter long tunnel beneath a portion of the village, and a new pedestrian mall on the existing main street extending through the village core. 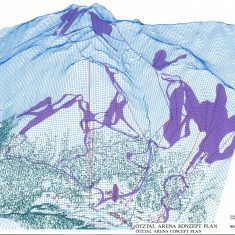 Ecosign’s proposal was acclaimed in Europe as the model solution for traffic and transportation problems plaguing the valleys of the European Alps. Twenty two years after Ecosign’s original concept of a bypass route, the Gemeinde of Sölden is undertaking community workshops of the newly engineered plans and receiving positive feedback from the citizens of Sölden. This project may finally be realized within the next decade.